It's finally out in the wild! The Fantasy Grounds version of Into the Wintery Gale has been released. This is very exciting for me as this was the last pending aspect promised to backers of the original Kickstarter. After hundreds of thousands of words, hundreds of pieces of art, a whole series of books, a hardbound mega-adventure, side-quests, a bestiary, magic item compendium, miniatures and tokens, poster play maps, terrain, and cards, I can state the project is now 100% complete. Skol! 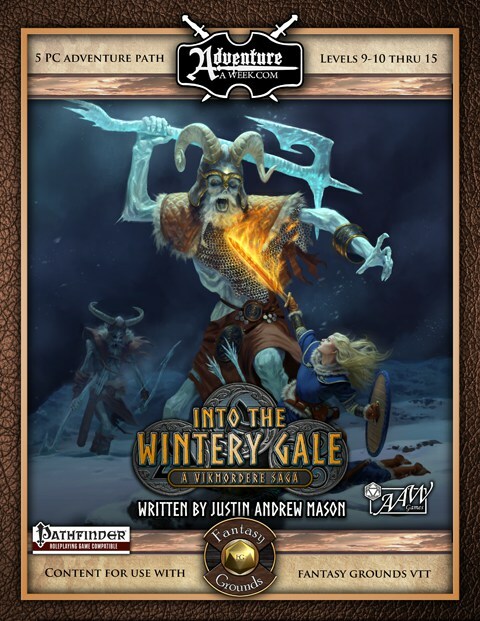 This product is available for purchase at Adventureaweek.com, DriveThruRPG, RPGNow, Paizo, Fantasy Grounds Marketplace, and on Steam.